Singer-songwriter, guitarist and entertainer Brad Paisley’s talents have earned him numerous awards, including three Grammys, two American Music Awards, 14 Academy of Country Music Awards and 14 Country Music Association Awards (including Entertainer of the Year. A proud member of the Grand Ole Opry since 2001, Paisley has written 21 of his 24 No.1 hits and has racked up over 20 million in album sales. His 11th studio album, Love and War, was released in 2017. Late 2018 saw the release of his new single Bucked Off that he debuted at the 52nd Annual CMA Awards, which he co-hosted for the 11th year with Carrie Underwood. Hugely popular with UK audiences, Brad last played on this side of the pond in 2017 when he headlined the Country To Country Festival in London, Glasgow and Dublin. 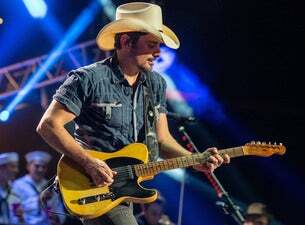 The country superstar Brad Paisley is returning to the UK to play London’s The O2 in October 2019 with support from Chris Lane.